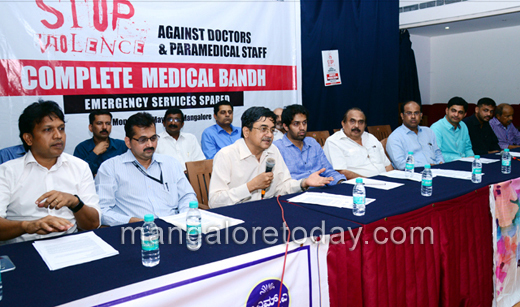 Mangaluru, May 21, 2017: Dakshina Kannada and Udupi dedical services to be affected for 24 hours from Monday morning following a day-long protest by doctors. The Indian Medical Association and other associations have called for a protest against the assault of Assistant Professor of Yenepoya Medical College and Hospital Abhijit Sudhakar Shetty on the hospital premises. Addressing media on May 20, Saturday, In-charge President of Indian Medical Association K.R. Kamath said no services, except emergency medical services and ICU, will be available for 24 hours from Monday morning in the hospitals in Dakshina Kannada and Udupi. Dr. Kamath said doctors will take out a protest rally from Ambedkar Circle to the office of the Deputy Commissioner at 10 a.m. tomorrow, Monday. The rally will be followed by a protest meeting at Nehru Maidan, Dr. Kamath said.